Print length: 257 pages. Buy on Amazon. You’re a creator – be it writer, film maker, musician, artist or entrepreneur. Many of the things you love, read, listen to, watch or use are over 10 years old. You want to understand why some creations become timeless sellers. perennial | adjective lasting or existing for a long or apparently infinite time; enduring or continually recurring. 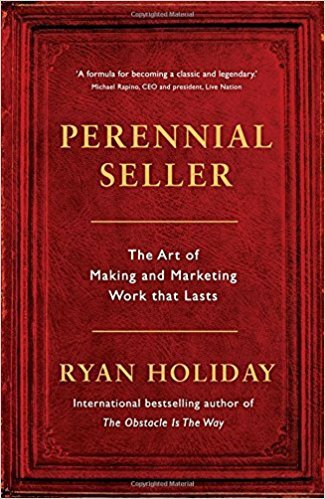 Ryan Holiday’s “Perennial Seller” is a book for creators that explains how to build for timeless and enduring impact. It serves as a refreshing reminder of long term value in an age where many industries (and governments) seem so fixedly short-termist. True to its title, the book favours time-tested, practical and inspiring home truths over get-rich-quick hacks. I learned a huge amount from reading it and am looking forward to applying its principles in my own writing. I will certainly be re-reading it and these notes again in the future. The book divides into two main parts. In Part I: “Making a Perennial Seller”, Ryan describes what it takes to create in a way that withstands the tests of time. In Part II: “Marketing a Perennial Seller”, Ryan explains both how to ensure your message is heard and also why it is important be personally at the centre of the marketing process. Ryan’s own extensive reading and network is evident in the number of powerful examples and quotes throughout the book. These help to add an enduring sense of depth and credibility to his arguments. If you love reading and/or don’t know of Ryan’s work I strongly recommend a visit to his blog and signing up for his excellent monthly reading list. I’ll be crunching many of the books that appear on it in the coming months. “Perennial Seller” is available on Amazon in both kindle and paperback editions. … and ‘genius is 1% inspiration and 99% perspiration’. Aim for lasting (> 10 years) impact and relevance. Harden yourself to short-term measures of success. And you must prepare to meet the demands of delivering massive value. Know your genre conventions and audience expectations. Be bold and experiment with breaking its conventions. But not too many at once, it must stay accessible. Picture creating for just one specific person. Create for your core audience only, crossover is a bonus. If the problem is not significant, why should people care? If the problem is not relevant in 10 years, nor is the solution. Create, evolve and refine until perfect. Start small – testing early and often. Grow from e.g., concept to conversation to article to talk to book. Test for external resonance and feedback at each stage. Change and pivot early in response to feedback. Next, write the first draft. Consider a pre-rest/drawdown period to prepare physically and mentally. Then create intensively and with your audience of one always in mind. Make time and space to focus on nothing else during this period (see Deep Work). Now, prepare for extensive rewriting, editing and refinement. Understand that this process is usually as long or longer than the writing. Seek feedback externally – from editors and audience members you trust. Be open to feedback, even if it’s major – many classics are total rewrites of their first draft. Keep iterating, even after release – many classics only peaked in later editions. Keep the positioning specific (even if it needs updating) and stay resolute to your aim of longevity. Word of mouth sustains life, marketing creates it. The Lindy effect: The chance of something disappearing decreases the longer it exists. Word of mouth is the self-sustaining heartbeat of a perennial seller. It passively refreshes discoverability in the absence of active marketing. It converts better (50x so for trusted and emphatic vs. low quality word of mouth). It feeds on and multiplies itself. To qualify you must first deliver massive value (see Part I). But even then, you must make yourself heard. There is more competition for our limited attention than ever before. A creation must stay above this noise or disappear into it – no matter how good it is. Marketing brings a creation momentarily to the surface and gives it a chance at life. You must take personal responsibility for driving discoverability and building a platform. Many shy away from marketing. To distance themselves from judgement/failure. But you cannot outsource it, nor should you want to. Nobody cares about your creation as much as you do. Nobody understands the positioning as well as you do. Giving up control means leaving everything you’ve worked for to chance. Your job is to tell people what your creation is and why they should care. Marketing is anything that gets and keeps customers. Its goals are to drive short term discoverability and build a long-term platform. Driving discoverability is a sprint: it is creation specific and has diminishing returns. Concentrate on a launch day. Bring relationships, media contacts, past experience, favours, budget and allies to bear. Choose a date with a hook (e.g., international XYZ day). Use this spike to puncture through the noise. Sacrifice short-term profit for discoverability (often cheaper than you think). Create a core following by giving away the first X units for free (e.g., as samples or to influencers). Give part of your service away for free to drive sales in others (e.g., free TED videos vs. $10k USD conference tickets). Price for accessibility and discoverability – don’t let ego stand in the way of impact. Use occasional short-term price drops to drive sales. Often has a prolonged impact. Find, engage and prefer organic, existing users of your creations over paid influencers. Consider non-traditional influencers (e.g., business figures or politicians over celebrities). Offer don’t ask: help them, send free things (enough to give away to their friends). Be wary of traditional media. Can be useful as part of a larger campaign by building a profile and credibility. But rarely gives a good direct return on high cost of time and money. If you still want it: Start with smaller, niche outlets. They appeal directly to your target market (remember Positioning). … and also create momentum by feeding into them anyway (like tributaries into a river). News-jacking. Adapt quickly to and piggy back on ‘hotter’ trends (e.g., accepting bitcoin payments). Creative advertising. Attention grabbing but risky for big corporates and so often overlooked and under-competed for. Publicity stunts. Give reporters something to write about. Be bold (but not too bold). Being direct. Google reporter contact details. Call them. Make it interesting by being interested. For everything else (e.g., social media) adapt, test widely and double down on results. Adapt to the channels available at the time (this changes rapidly). Adapt to the features and popularity of those channels (changes even more rapidly). Try a bit of everything. See what sticks. Double down on it. Building a platform is a marathon: it benefits all your creations and is compounding. A platform is all the tools, relationships, access and audience you have to spread creative work. Building a direct (e)mailing list by providing massive value. Give something free – an ebook, a sample, a service (e.g., book recommendations). Run competitions and sweepstakes – make the free offer time-limited. Do things by hand – create a physical form you can hand out at events. Do a swap – Cross promote with another creator’s list. Make it easy – Use pop-ups and simple sign up forms, put a link in your email signature. Ask your existing contacts to join – export your social network followers, ask family and friends. Build a karma positive network (contacts, relationships, influencers and fans). Never dismiss anyone – rule #1 is just be a nice person. Play the long game – all senior decision makers were once fresh faced minions. Focus on pre-VIPs – engage people who should be famous, even if they’re not yet. Participate – honestly and authentically with your network and fans (see rule #1). Be a giver – give long before you think of receiving. Always stay karma positive (See Give and Take). Good work compounds itself – the more value you deliver, the wider your platform will grow. Which is why making is also marketing – building a platform is part of building a career as a creator. Reach out to new fans. Collaborate with other creators to make something new that promotes crossover. Create variations on your portfolio that expand as well as serve your current audience. What new areas would my expertise be valuable in? Can I cut out the middleman and invest myself? Can I help other creatives achieve what I have? What are people in my field afraid of/looking down on? How can I diversify my income stream? What would I do if I took a break from creating? What components around my work can I improve or grow? “How Great Leaders Inspire Action”, Simon Sinek: The structure of this 20 minute TED talk bears striking similarities to Ryan’s book. It was also the inspiration for the title of this blog. “How I Built This” , NPR: Is a podcast about innovators, entrepreneurs, and idealists, and the stories behind the movements they built. A fascinating insight into the stories of some of today’s Perennial Sellers. “Give and Take: A Revolutionary Approach to Success”, Adam Grant: This wonderful perennial seller is a fascinating insight into the network building power of becoming a giver rather than a taker. “Shoe Dog: A Memoir by the Creator of NIKE”, Phil Knight: A fascinating and candid memoir from one of the 20th Century’s greatest entrepreneurs and perennial creators. “Steve Jobs: The Exclusive Biography”, Walter Isaacson: As above. “Elon Musk: How the Billionaire CEO of SpaceX and Tesla is Shaping our Future”, Ashlee Vance: And again. See also this excellent series of posts from Wait but Why. – What sacred cows am I slaying? – What dominant institutions am I displacing? – What groups am I disrupting?